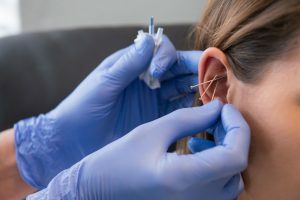 Auricular needling technique to assist with specific ailments and addictions as a combination therapy. ACUDETOX is performed by a licensed specialist and it involves the placement of acupuncture needles in five points on each ear. By activating these points through acupuncture, your body will become more relaxed, while also becoming more effective at cleansing your system of any toxins and emotional trauma. Once the needles are placed, the client(s) relaxes in a seated position 30 to 45 minutes. This can be an individual session or performed in a group. ACUDETOX is also known as acupuncture detoxification, auriculoacupuncture, auriculotherapy, ear acupuncture, and five-point ear acupuncture. The needles are fine gauge, disposable, sterilized, and stainless steel. The benefits of ACUDETOX are numerous. These are but a few of the many ailments that can be alleviated by ACUDETOX. The treatment recognizes that not one single component of a comprehensive recovery or health programme can be seen as a “cure” or “stand-alone” therapy for any condition.